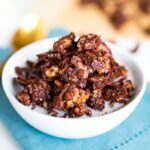 Homemade, chocolate grain-free granola that is low in sugar, low in carbs and also happens to be delicious! 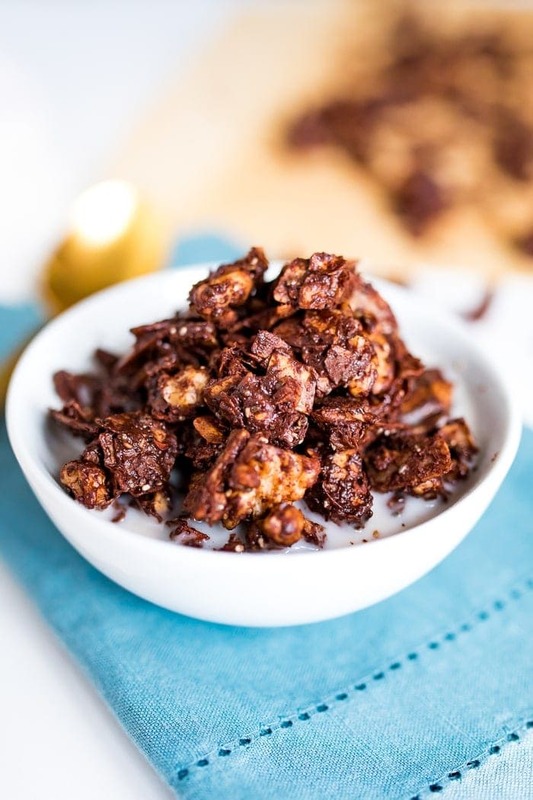 This decadent, but healthy chocolate granola is perfect for snacking. Paleo, vegan and gluten-free. Do you go in granola phases? Or is that just me? I feel like I am granola’s biggest fan and then forget about it for months! I’m in a granola loving phase right now and this chocolate coconut walnut granola is giving me life. It’s a spin-off of this grain-free coco-nutty granola (just in case you need to add another granola to your rotation!). 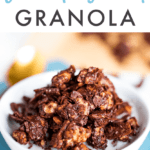 What I love about this granola combo is that it’s loaded with chocolate flavor but still grain-free, low in sugar and low in carbs! I’ve found that it’s hard to come by granola in the store that meets all of those qualifications. To keep the granola lower in sugar I like using a little brown rice syrup with a sprinkle of granulated stevia. Of course you can always try the recipe with your favorite liquid sweetener. I have a feeling honey or maple syrup would work well, but brown rice syrup is a bit stickier and definitely helps the granola clump. Eat it straight off the pan… obviously! I love fresh granola and can hardly wait for it to cool before diving in. Top a yogurt or smoothie bowl with it! Having a good crunch with my yogurt and smoothie bowls is key! I’m mindful of the flavors I’m mixing, but it’s kind of hard to go wrong. Top a salad with it. 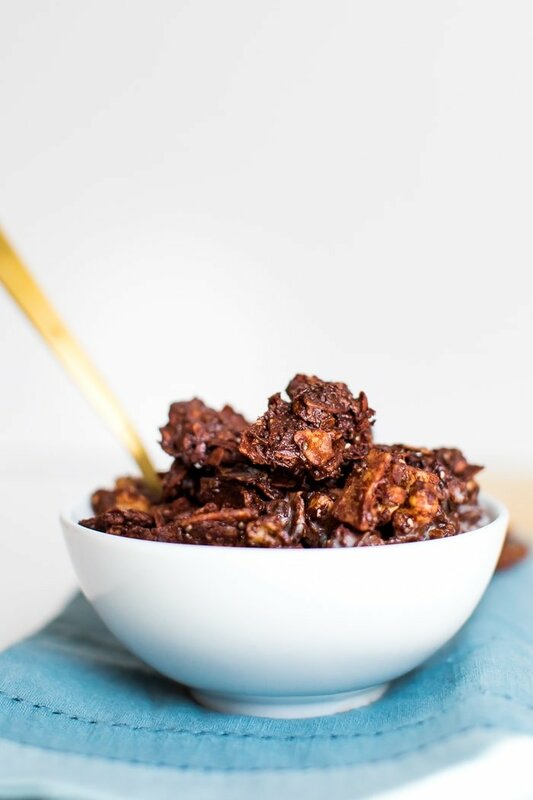 This might be kinda weird with this recipe (but I won’t judge) but a less chocolate-y granola is amazing as a salad topper for a little added crunch! 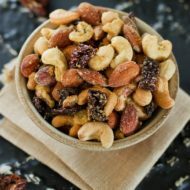 I use the coco-nutty granola as a salad topper all the time. 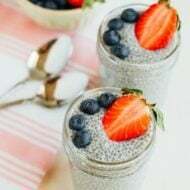 Add it to or top off chia pudding or oatmeal – again, love a good crunch. Add it to muffins or other baked goods. Mmm a granola crumble?! Use it as a fruit topper! I love having fruit like bananas and apples with nut butter… adding some granola sprinkled on top takes it to the next level. I feel like this list could be 100 points long but I’m going to cut it off at 6. What’s your favorite way to eat granola?! Preheat oven to 250°F and line a baking sheet with parchment paper. Combine all ingredients in a bowl, mix thoroughly and spread evenly on the baking sheet. Bake 30-40 minutes until crisp, rotating halfway through cooking time. Remove from oven and allow to cool, then eat while it’s still crispy. I like to store the leftovers in the fridge or freezer to keep the granola extra crispy. 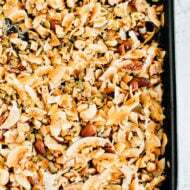 Recipe adapted and inspired by the I Quit Sugar Grain-Free Coco-Nutty Granola. 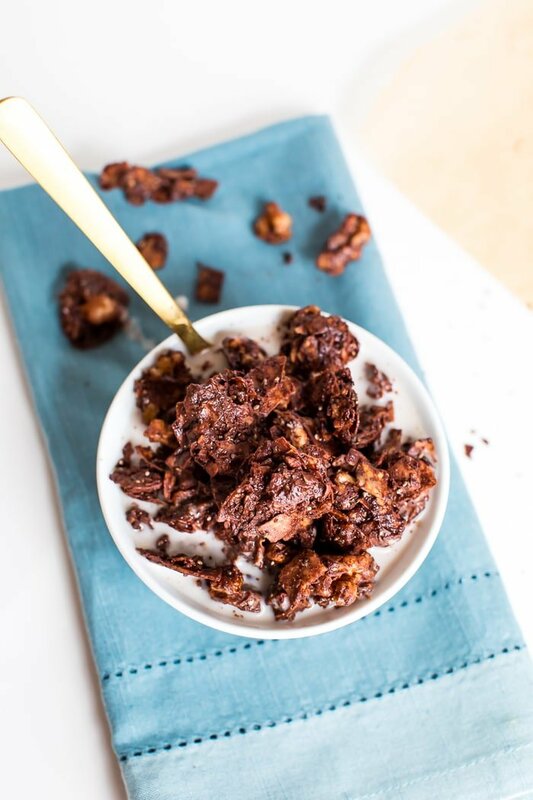 If you try this chocolate grain-free granola please leave a comment and star rating below letting me know how it turned out. 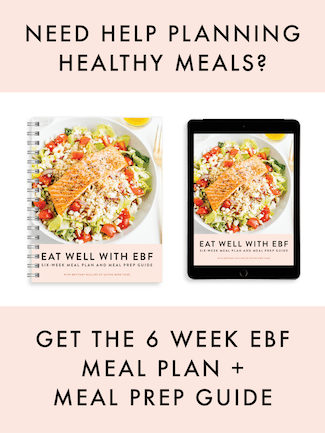 Your feedback makes my day and helps other EBF readers! Love grain free granola! I made a version really close to this a couple months ago! I looove grain-free granola. This delicious recipe is inspiring me to make some. It’s impossible not to eat it straight from the pan!